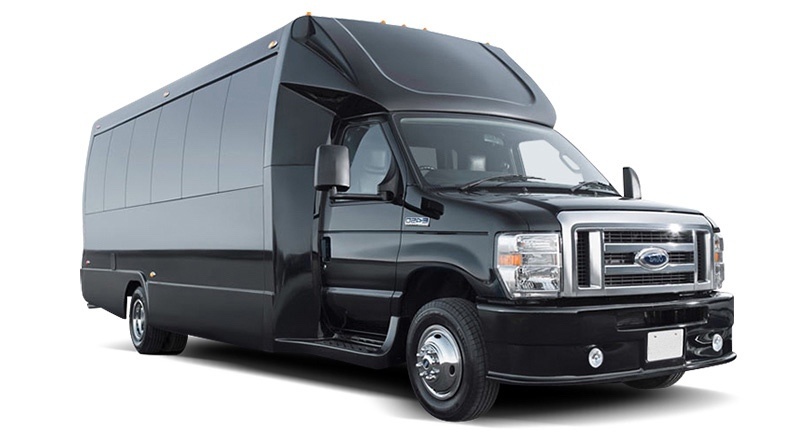 One of the hottest looking buses to ever be built, Legend’s all Black Limo Bus offers the ultimate in curb appeal. The exterior features a seamless fiberglass body with sleek, frameless windows. The aluminum wheels and custom bumper with ground effects add to the “wow” factor. The interior is perfect for any occasion. Comfortably seating 18 people, this bus offers a full 8 feet of headroom. Interior options include hardwood floors, custom leather seating, and a hand crafted Corian bar with a wine bottle refrigerator. For entertainment, there is a total of 4 flat screen televisions (35” TV on the back wall, a 27” TV on the front wall, and 2 15” TV mounted on the side walls). The 1,500-watt stereo system includes 2 12” sub-woofers. A stainless steel pole is mounted toward the rear of the bus and is easily removable for a more subtle occasion. The rear luggage compartment also makes this a perfect option for airport & cruise ship transportation.